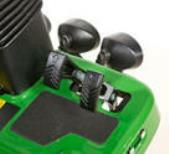 The 8000A E-Cut ™ Hybrid fairway mower has cutting units that contact up stops for transport. Units transporting down cart paths or bumpy terrain. 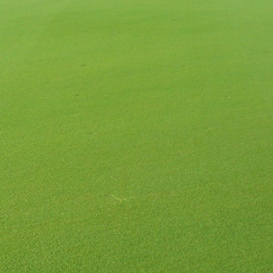 Hill-climbing power is essential with any golf course and this is one area where the 8000A E-Cut™ Hybrid truly excels. A powerful turbocharged diesel engine supplies power to the system. Combine that with a new larger eHydro™ and wheel motors the GRIP all-wheel drive traction system and the 8000A E-Cut Hybrid is one powerful hill-climbing machine . 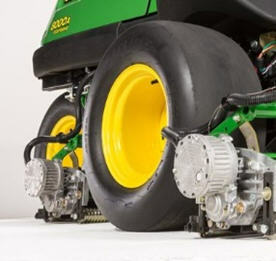 The new traction drive includes an eHydro™ hydrostatic pump with 35 percent more flow and 17 percent more wheel torque than previous models to deliver the hill climbing performance expected with a fairway mower. 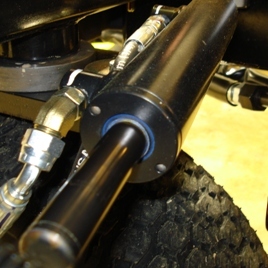 The GRIP system transfers hydraulic flow from wheels that slip to wheels that grip. For example, if the right front wheel starts to slip, hydraulic flow goes to the left front and rear tires to maintain traction power. The GRIP all-wheel drive traction system is standard equipment with the 8000A E-Cut Hybrid and it is also engaged at all times, in mow or in transport. 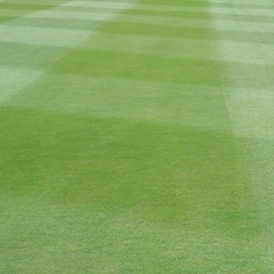 Ever wanted to mow fairways with the same quality straight lines mowed on greens? The double-acting, dual-rod hydraulic steering cylinder on the 8000A E-Cut™ Hybrid Fairway Mower does exactly that. 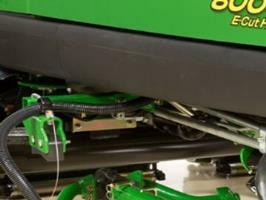 Using the same technology as incorporated on other PrecisionCut™, E-Cut Hybrid, and TerrainCut™ Mowers, the 8000A E-Cut Hybrid Fairway Mower produces high-quality straight lines through its unique steering system. 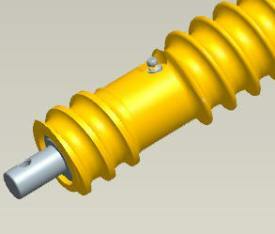 A rod on each side of the cylinder equalizes volume and pressure on each side of the cylinder, meaning equal steering effort from side to side. 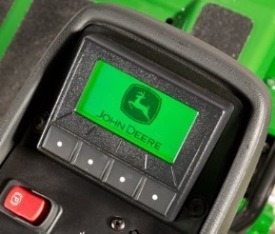 Once the cylinder is centered, it tracks as straight as an arrow. That means fairways and other areas can be mowed as straight as an arrow. The 8000A E-Cut™ Hybrid Fairway Mower helps to make fairways that look like greens a reality. 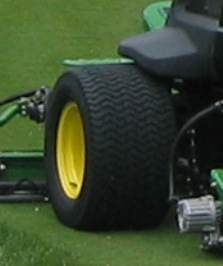 An innovative, smooth tire design minimizes compaction and tire marking, especially in turns, giving a look similar to that from a riding greens mower. The GRIP all-wheel drive traction system works in combination with the smooth tire design to give a greens quality appearance without sacrificing traction. 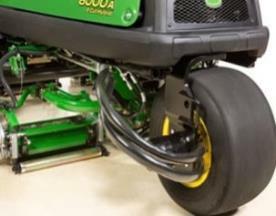 The 8000A E-Cut Hybrid also excels at weight distribution, ensuring each tire sees an equal amount of weight over a large tire surface area for a ground pressure that is friendly to the surface of the turf. 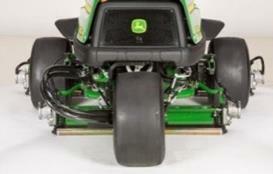 The 8000A E-Cut Hybrid has a three-wheel stance, also common with riding greens mowers in the market today. 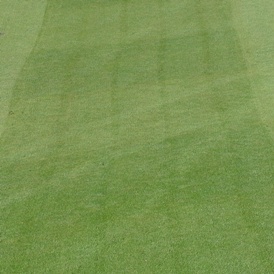 This provides an after-cut appearance that is so good it looks like the fairways were mowed by a greens mower. The three-wheel stance also excels in maneuverability, allowing for tight turning at the end of passes for increased productivity. For those who prefer to use a treaded tire rather than a smooth tire, a 24x12-12 UltraTrac tread is also available through Parts. The eHydro™ traction pump and wheel motors in the new A-model take performance, traction, and operation to the next level. The new system was designed to take on the most challenging course conditions. The traction drive pump flow increased 35 percent and the wheel motors increase 17 percent in displacement over prior models. These increases to the traction system makes the A-models ideal for undulating terrain providing superior performance and traction out on the course. 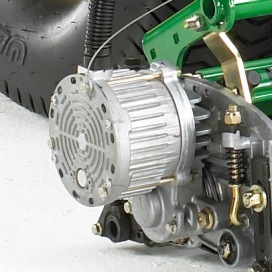 The new traction system in the A-models is driven by a servo-controlled hydrostatic pump. 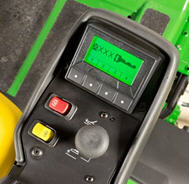 The control of the pump is no longer mechanical linkages, but instead is electronic. 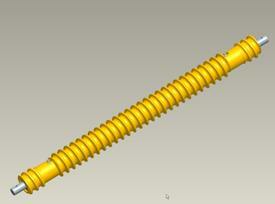 Approximately 110 parts have been eliminated from the traction drive system compared to prior models. The new design also eliminated two adjustments. Reducing the complexity of the drive system means no more linkages to adjust or repair, decreased routine maintenance, and providing reliable day-in/day-out operation. Front and rear: 51 in.